Tearing my ACL has been one of my biggest life lessons in trusting my intuition. In December 2007 I decided to step on a very small tree trunk that fell in the backyard rather then using a saw to cut it. 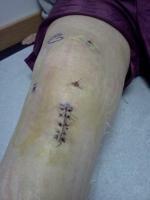 I tore my meniscus at that time and was in a lot of pain for a few months. After having an MRI the doctor said some people live with torn meniscus and others have arthroscopic surgery depending on their level of pain. I waited and the pain lessened so I decided not to have the surgery. Then on October 19th 2008 upon returning from a vacation and emptying my suitcase that was on the floor. (this is where had I listened to my intuition I would have moved it a bit earlier) I stepped in it to get to my next destination and the suitcase slid across the hardwood floor and so did I! I heard the pop as my knee twisted while I was in the air. I landed in pain, got an MRI, have a complete tear and decided to go with ACL reconstruction based on the fact that I love to ski, hike, walk and do other activities. I did not want to compromise having fun and having to hold back on any activities in my life. After all, I have at lease 30 good years of being active. My surgery is coming up on no other than December 31, 2008. Happy New Year! I have a very positive outlook on the whole situation. I am a fast healer and have people in my life who will be cheering me on for a quick recovery so that we can go walking and hiking soon! I was fearful of many aspects of the surgery but I have come to trust the universe and the lessons to be learned from this experience. I will be taking before and after pictures to share sometime soon.